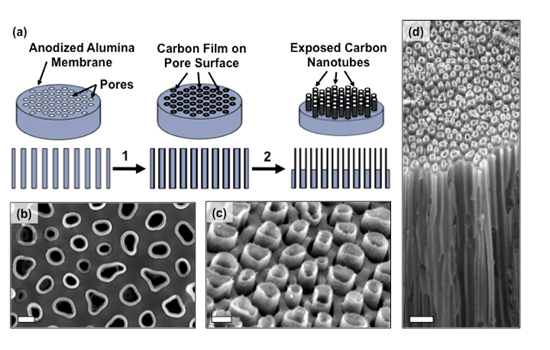 This graphic illustrates the device fabrication process and the edges of the bundled carbon nanotubes used to introduce bio-molecules into cells. Researchers from Rochester Institute of Technology and the University of Rochester Medical Center have developed a new, more efficient method for gene transfer. The technique, which involves culturing and transfecting, or inserting, bio-fluids into cells through an array of carbon nanotubes, has the potential to overcome the limitations of other gene transfecting technologies. “This represents a very simple, inexpensive and efficient process that is well-tolerated by cells and can successfully deliver DNA into tens of thousands of cells simultaneously,” said Michael Schrlau, co-author and assistant professor of mechanical engineering in RIT’s Kate Gleason College of Engineering. Gene modification can enable researchers to precisely target segments of genetic code giving rise to a range of potential scientific and medical applications from fixing genetic defects, to manipulating stem cells, to reengineering immune cells to fight infection and cancer. “This platform holds the potential to make the gene transfer process more robust and decrease toxic effects, while increasing amount and diversity of genetic cargo we can deliver into cells,” said Ian Dickerson, associate professor in the Department of Neuroscience at the URMC and co-author of the paper, “High-efficiency gene transfection of cells through carbon nanotube arrays” described in a study published in the journal Small. However, all of these methods tend to suffer from two fundamental problems, Dickerson explained. The processes can be highly toxic, leaving scientists with too few healthy cells to work with, and the methods are restricted in the amount of genetic information they can deliver into the cells. This limits their application. These techniques can also be time consuming and expensive. The new device described in the study was fabricated by Masoud Golshadi, a doctoral student in Schrlau’s Nano-Bio Interface Laboratory at RIT. This lab research team investigates nano-manufacturing techniques to produce novel materials and devices to interact with biological systems. Carbon nanotubes are cylindrical lattices made of carbon fibers that can be used in the development of electronics, optics and nanotechnology. They are smaller than the width of a human hair, are light weight but strong and capable of thermal and electrical conductivity. The carbon nanotube arrays that Schrlau developed are shaped like tiny drinking straws and a series of them are bundled together to spread fluids or molecules to cells over a larger surface space, increasing the ability to introduce more test bio-fluids into larger, and more varied populations of target cells for analysis, Schrlau explained. Using a process called chemical vapor deposition, researchers created a structure akin to a honeycomb consisting of millions of densely-packed carbon nanotubes with openings on both sides of a thin disk shaped membrane. The mechanism of DNA transfer is still under investigation, but the researchers believe it may be accomplished through a process called enhanced endocytosis, a method by which cells transfer bundles of proteins back and forth through the cell membrane. The device has also shown the ability to successfully culture a wide range of cell types, including cells that are typically difficult to grow and keep alive, such as immune cells, stem cells, and neurons. Additional co-authors of the study include Golshadi and Leslie Wright, associate professor of biotechnology and molecular bioscience in RIT’s College of Science. The research was supported with funding from the Schmitt Program on Integrative Brain Research, the American-German Partnership to Advance Biomedical and Energy Applications of Nanocarbon, Texas Instruments, the Feinberg Foundation and the Weizmann Institute of Science.